The KAEFER team in Brazil of RIP Serviços Industriais has launched the "RIP in Balance" programme to support the health and well-being of their employees. Quizes, games and newsletters promote physical exercise, healthy eating and attention to well-being - to keep body and mind in balance. What a great initiative! KAEFER KOSTEC recently finished the project "Polideportivo Villa El Salvador" for the Pan American Games in Lima 2019. Working for the contractor Consorcio Construcción Lima 2019 OHL-JE, KAEFER KOSTEC applied fire protection coatings to the stadium structures. This was the first painting job performed by KAEFER in Peru. After the excellent results and the very positive feedback received from the client, we are looking forward to further develop this very important business in Peru. On 5 April the Kinderhospiz Löwenherz e.V. 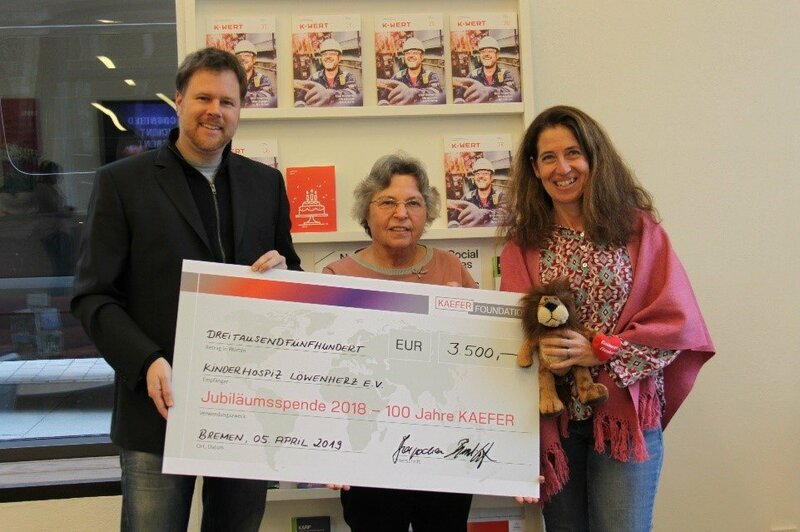 received a donation from the KAEFER FOUNDATION, which was collected on the occasion of the KAEFER centenary in 2018. The donation supports the incredible work of volunteers dedicated to children and young adults with uncurable diseases. Read more here.